Clinicians who are committed to quality and patient safety frequently lack the means and infrastructure to implement and sustain the interdisciplinary collaboration needed to actualize system improvement. The Faculty Hour model affords surgeons, anesthesiologists, nurses, and others the opportunity to meet together at the start of the day once each week to advance quality and outcomes for patients, to accelerate learning and innovation, and to foster mutual joy in work. Agency for Healthcare Research and Quality. Hospital Survey on Patient Safety Culture. 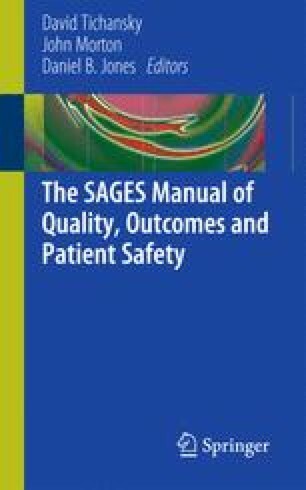 Gaithersburg, MD: AHRQ, 2010. http://www.ahrq.gov/qual/patientsafetyculture/. Accessed 19 Oct 2010. Baldrige Performance Excellence Program. Are We Making Progress? Gaithersburg, MD: National Institute of Standards and Technology, 2008. http://www.nist.gov/baldrige/publications/progress.cfm. Accessed 19 Oct 2010.